BrainPrint shows shape differences in the brain that are unique to each person, similar to a fingerprint. Mass General researchers have created a computer-aided system named BrainPrint that tracks shape changes in the brain years before disease symptoms appear. Brain imaging is beginning to unlock the mystery of how to distinguish people with minor memory issues from those who are in the silent, early stages of Alzheimer’s disease or other dementias. Massachusetts General Hospital researchers at the MGH-HST Athinoula A. Martinos Center for Biomedical Imaging are using a computer-aided way of analyzing magnetic resonance imaging (MRI) brain scans they created called BrainPrint. 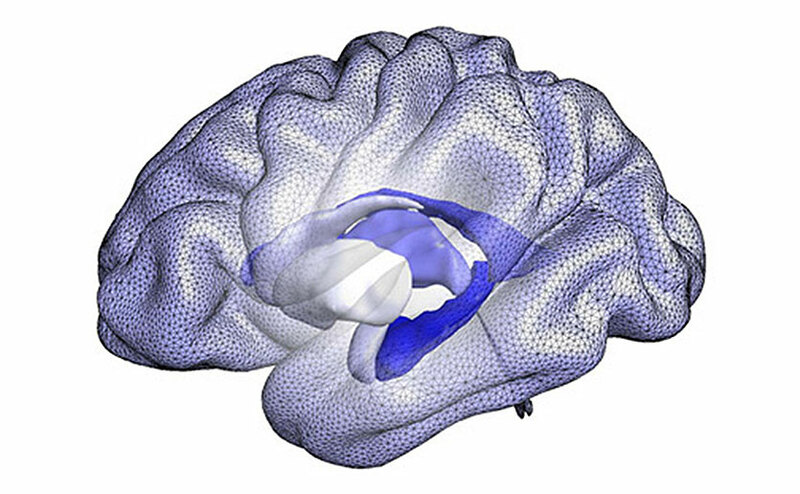 It is finding differences in the shapes of critical structures between the right and left sides of the brain in people later diagnosed with Alzheimer’s. The more severe the disease, the greater the shape differences. The hope is that with further research, BrainPrint can identify people likely to develop Alzheimer’s before there is extensive brain damage. Although there is currently no way to prevent, slow or cure Alzheimer’s and other dementias, researchers are testing many drugs. Those most at risk could potentially start early on a promising experimental drug. The structure and function of the two sides of the brain are slightly different. This asymmetry between the two sides is key to the brain’s ability to handle complex functions. As people age, there tends to be more asymmetry. “But the asymmetry is much stronger in someone with Alzheimer’s disease or even mild cognitive impairment,” Dr. Reuter points out. Brain imaging methods allow neuroscientists to essentially see into a living brain. Through imaging, they can find areas of the brain affected by disease, track progression of the disease in the brain and test the effects of new treatments. Before BrainPrint, researchers have more typically looked for signs of early shrinkage in the size of brain areas affected by Alzheimer’s. The hippocampus and amygdala, for example, are where memory, high-level thinking and language are controlled. At Dr. Reuter’s Laboratory for Computational Longitudinal Neuroimaging, he’s been interested in changes over time in both volume and shape of brain structures. “Quantifying changes over time is more sensitive than just one snapshot of a person,” he says. The director of the Martinos Center, Bruce Rosen, MD, puts Dr. Reuter’s findings into perspective. “Once the symptoms of Alzheimer’s have progressed, a neuroradiologist can see changes on an MRI,” Dr. Rosen says. This is somewhat akin to selecting an avocado for ripeness, Dr. Rosen explains. Avocados that are ripe now are obvious, but how do we know which will be ripe in two days? “If you look closely, there are subtle clues, like changes in color or in how the skin is folding, that indicate which will soon be ripe,” he says. Dr. Rosen has pioneered many imaging advances during the 25 years since Martinos Center investigators introduced functional magnetic resonance imaging (fMRI) to map brain activity through blood flow. BrainPrint, in fact, builds off another software tool developed at the Martinos Center called FreeSurfer. Among other things, it analyzes the volume of structures from MRI scan data. Dr. Reuter’s team then uses BrainPrint to look at shapes and machine learning tools to do the analysis. For information on how to support the research at the Martinos Center for Biomedical Imaging, please contact us.